Anyone living in Ireland during the month of May will know that it’s Communion season. It matters not whether you are Catholic or not, if you have a child of a certain age you will be continually asked during the preceding months if they are a) making their Communion ( a step up from when the assumption was that every child in the land made their Communion!) and b) if you are “all set” for the Communion. It’s a national obsession, a bit like the weather. When I’ve been asked if I’m “all set” in recent weeks my first though is, as ever, about the food. Dress, hair, shoes doesn’t bother me but the need to get the food right and to have enough for everyone was my preoccupation. Well, it all went grand and no one left hungry so if you currently find yourself in the build up to a communion or any other gathering this post might help. Here’s what we served on the day ( I say we but sure of course I mean I! ) The need to have as much prepared ahead was key to deciding on what to make, I didn’t want the morning spoiled by having to fuss in the kitchen. I’ll give a rough timeline on what I did and when as it might help. There are very few photos as I didn’t have time to take them! I was working Friday but thankfully only in the afternoon so I did most of my cooking on Friday morning. That meant Friday night was free to make a fuss of the communion girl and relax. I spent an hour or so doing the last few bits on Saturday morning before the children got up . A frazzled kitchen on the morning of an event is a recipe for disaster so adjusting your menu to avoid this is the key for a good day. I baked about 12 potatoes for about 1 hour, when cooked and cooled enough to handle I halved them and scooped out the potato, I mashed the potato with salt and pepper and added in cooked panchetta, sour cream, chives and cheese. I put this mixture back into the potatoes and sprinkled over some more grated cheese. These were covered and put back in the fridge to go into the oven after the service on Saturday. I use a version of Neven Maguire’s Recipe . It’s a quick and easy recipe and turns out right every time. I quadrupled the ingredients and I use a mix of field mushrooms and exotic mushroom ( which i get in Aldi) instead of button mushrooms as i think it gives more flavor. I used a large fillet of ham, I put it in the slow cooker with 330ml of cider and cooked it for about 7 hours on low, then glazed it quickly in the oven. This was requested by the Communicant herself and it is Karen from Kenmare Foodies Recipe It is a foolproof recipe that I have made a good few times now and is a winner in this house. I made the sauce on Friday and cooked the pasta on Saturday morning as pasta bakes have a tendency to thicken up and dry out if made too far ahead. My daughter had asked for one of these for her birthday a year or two ago. 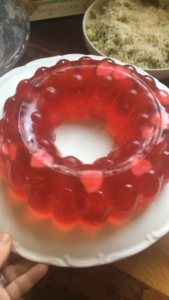 At the time I found a retro jelly mould and this is what i used to make the jelly cake, we put haribo jellies into the jelly before setting and we filled the inside of the cake with jellies when it was set…just in case there wasn’t enough sugar coursing through their veins after the Piñata! 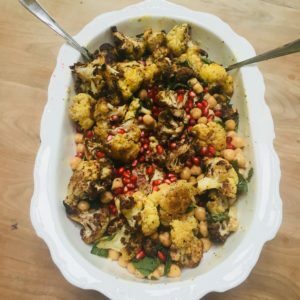 Roasted Cauliflower and Chickpea Salad. This was SO good, it was an experiment as I’d never made it before but it will definitely feature again. After the ceremony I made Pilau rice and put the stuffed potato skins into the oven along with the Mac N Cheese to finish off. My sister brough a delicious side of Salmon which she had done on the BBQ and she also made a beautiful communion cake. There were lots of leftovers which were perfect for lunch in the sun on Sunday. It was such a lovely day spent chatting, laughing and sharing food ( and a few glasses of wine) with family and friends…it doesn’t get much better than that. Sounds fantastic, can I book you for May 2019? No problem at all, I’d love to cater in the fancy new kitchen you’ll have!